Consternation abounds in some quarters (probably) at TfL’s proposals to change some of the bus routes and times in our very own piece of London suburbia. 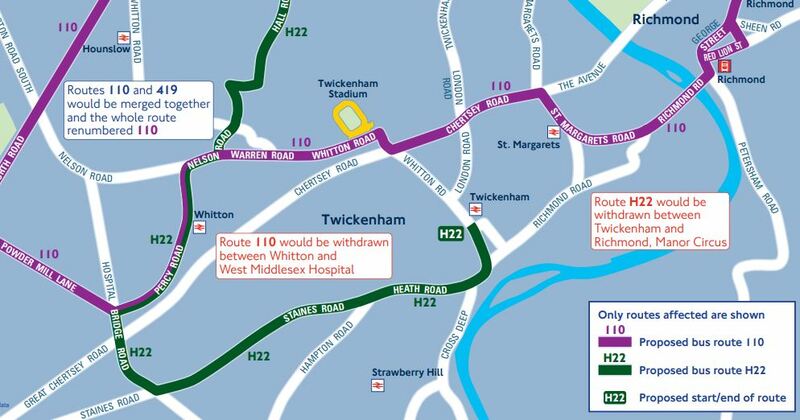 TfL is currently running a consultation about a number of routes in Twickenham and Richmond, of which the changes to the 110 are probably the most significant. The existing 110 route runs from Hounslow, into Twickenham via Staines Road, through the town centre then on past the station to West Middlesex Hospital. Under the proposals the new route would bypass central Twickenham and instead go via Whitton, past the rugby stadium, then along the A316, into St Margarets and then Richmond and on to wherever the hell is beyond that. It would no longer serve West Middlesex Hospital. The H22 route would be changed to run from Hounslow Bell Corner (you’ve seen it on the front of the bus but you’ve never been there, have you?) to Twickenham station (but not necessarily right outside it) rather than Richmond. This will mean fewer routes serving Twickenham from Richmond, especially along Staines Road. Meanwhile the H37 which runs from Richmond to Hounslow via St Margarets and Isleworth would see a reduction in frequency. “What is prompting all this?” you cry. Well, according to TfL, their reviews have “revealed a number of corridors running in Richmond, Twickenham and Whitton are operating with spare capacity. This means that buses are not full. There are also missing links around Whitton and Chertsey Road”. Oh yeah? Whether the changes make your life easier or harder will depend on where you’re going…. and where you start out, but if you’re a fan of going to hospital then they could make your journey a bit more awkward. Aficionados of The Inbetweeners may want to take this opportunity to simply shout “Bus wankers!” very loudly. However, if you’re actually affected by the changes you may prefer to have your say in the TfL consultation. It runs until 11th December (UPDATE: extended to 6th January). The changes will take effect in May 2019, unless of course they don’t. A bus. And it’s red. The H22 goes from Whitton to Richmond and has for years. When TFL first introduced the ‘new’ 110 route to the hospital back in 2016, they issued a document in response to the main issues raised. This stated at the time that running the 110 between Twickenham and WMH would benefit the hospital users and would also ‘provide extra capacity on route 267 to assist with higher passenger demand at school times in Isleworth’ , and that the 110 would ‘reduce crowding on route 267’. The population of Isleworth has increased hugely in the last two years so it would seem that there would be even more need to ‘reduce crowding’ and ‘assist with higher passenger demand’ than in 2016, but TFL have decided on a complete U-turn to their previously published arguments. They are also proposing to reduce the frequency of the H37 through Isleworth which would also seem to be increasing the problems arising from ‘higher passenger demand at school times’. Also, running a bus along the A316 would help no-body – its an urban clearway so there would not be any bus stops on this part of the route and the service would only help to increase the congestion on an already busy stretch of road, to say nothing of the detrimental effect on the reliability of the service of the buses being stuck in the jams which are a daily part of life on the A316. We are also being told by TFL that bus routes need to be shortened to improve their service – so how can extending a bus route from Whitton to Hammersmith possibly be efficient??? I do absolutely agree with the concerns about the 110 not serving the WestMids and have replied to the consultation accordingly. However there is a need for a route along the A316 to serve the new Richmond Upon Thames School on the Richmond College site which as a five form entry school will ultimately have 1000 students many travelling from along the A316 corridor (some even across the bridge) . The new proposed route was to run from the stadium to St Margarets so presumably with the intention that pupils would alight at the stadium and use the footbridge. I agree rerouting the 110 away from the hospital is not the answer but I do see there is logic to increasing provision to the school. Though the logic is actually to run routes that will serve both the Turing Whitton site and RUTS catchments in consultation with the schools / Achieving for Children (aka LEA in old money) in much the way the way the R70 wends its illogical way, preferably a way that means the rest of us can avoid the school time specials! That would probably be too logical and forward thinking though……. The changes to the H22 are madness. Getting from Richmond to Twickenham Green after work is hard enough anyway, with buses always full to capacity. Cutting the H22 route to start at the station makes no sense to me. The entirety of the existing 110 is odd so I understand why they would seek to make it more purposeful as an a to b route, but I’m surprised that they would so readily ditch the hospital element. I agree that there is a missing link between East Whitton / North Twickenham and Richmond. Being able to travel direct to St Margaret’s and Richmond would be useful, but repurposing the 110 to do it will negatively impact the existing customers. How about a bus that goes directly from Twickenham to Kingston please. For a lot of people, this is bad news. I live in Staines Road, am moving towards old age at some speed and have lung disease which has some effect on my mobility. Luckily transport is currently good – using the 110 I have access to Waitrose, the Post Office and Twickenham Station. I also have access to Richmond, including the station, using the H22 and 490. The 110 is being completely re-routed and will no longer serve Staines Road and surrounding streets. The elderly and less mobile needing to go to West Mid will now have to change onto the 267 – which drops you on Twickenham Road, leaving a walk (according to Google Maps) of over 200 metres to the hospital’s front door and 170 metres to the return bus stop afterwards. The 110 goes right to the hospital entrance, I’d guess 15 metres to the front door. The consultation doesn’t mention this fact, as though the two routes offer the same service. They don’t. Under these proposals the H22 would replace the 110 to London Road. 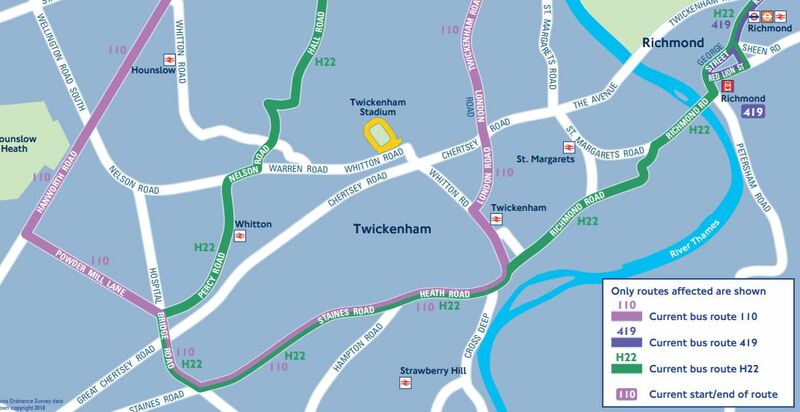 The consultation says “Route H22 would be rerouted to serve nearer to Twickenham station” – but it looks as though there will be no direct access to Twickenham Station JUST AS IT’S BEING UPGRADED, which is crazy. So if I want to go to Twickenham Station, instead of getting the 110 which stops opposite, I’ll now have to alight at Arragon Road and walk uphill to the station. So our sparkling new station will lose its one bus link to Staines Road while keeping its two bus links to Hampton Road. At peak times EVERY bus from Richmond to The Fountain / Sixth Cross Road and vice versa (i.e. the H22 and 490) is full. Packed. It is proposed that this route is halved to the 490 only. There really hasn’t been much publicity about this and if you’re not internet-savvy I don’t know how you’d find out. It now shows up on bus checker apps, but the same applies. How many school children use these routes? It must be hundreds. Hang around on Heath Road outside Stevenson’s between 3 and 4 o’clock! I’ve emailed all the schools likely to be affected by kids arriving late because there won’t be the bus capacity but haven’t received an acknowledgment from any of them (ditto ward councillors). There’s no way the 490 can cope at peak periods. With all the school kids, and commuters, and oldies like me, Staines Road needs three bus routes. If these proposals go ahead, the 490 timetable will have to be massively improved. Double-deckers would help but that wouldn’t impact on frequency. Needless to say, if you agree, do fill in the consultation survey. Cheers. If the 20mph speed limit is introduced this will also reduce capacity and increase crowding as the busses will not be able to cover the same distance per day. This will also make life harder for disabled people who need regular hospital visits! !